Quote PDR cannot actually produce a 1:1 video. The best your can do is use a png file as a mask or overlay in a 16:9 project to get the square look you want, essentially the sides blacked out. Then use one of many 3rd party utilities to crop the PD produced video to your 1:1 video that’s in the mask. Thanks Jeff! Been growing increasingly frustrated with PD's offering over past months, think this might be the final annoyance for me! Is there a way to output in 1:1 ratio with Power Director? Either a setting in the files or a workaround? I do not understand exactly what you want, check into AudioDiretor it has filters, equalizer ... maybe it has what you want. Does PD16 have a voice enhancement tool on audio files? E.g. if there there's chatter going on in the background of an audio file how to remove/decrease it? Other vid editors seem to have an inbuilt tool can't seem to find one on PD? Quote I'm looking for creative packs with pre built titles and social media icons designed for creating social media clips. Mainly, I handle clients' social media videos but everything I see are for holidays or weddings. I'm looking for some professionally done templates like I see for other video apps. Is anything like this available for Powerdirector? This is something I've been trying to sort as well for a while - ultimately PD isn't the best at producing the more slick and professional looking vids like what you're looking for. Some of the additional "travel packs" etc contain particular animations that are useful. Quote There is no way to do it automatically. But you can do it with the PiP Designer for one clip ("Scale" and "Position" in PiP Designer), copy the attributes and paste the attributes to the other clips. My point of view: We see the world wider than high. Except using smartphones. There the world is higher than wide. I don't like the 9:16 mode. Great thank you for clarifying - 9:16 isn't the most natural way but with Instagram now launching vertical videos, think it's likely we'll be seeing this much more frequently! Well this was extremely helpful and answered my question. Thanks. However when I change this setting on PD for the project, it automatically makes the horizontal vid fit fully into the vertical bars, so there's huge black gaps at the top and bottom. How can I make PD automatically zoom in to the centre of the original clip so it fully fillls the vertical screen? Aside from manually doing it of course - as my project is now dozens of tiny clips put together! I see from this one there is a way, however this severely distorts the image PD creates and is completely unusable! As an aside, I found a good way to circumvent this. If you just search "green screen title animations" on Youtube, people have uploaded loads of clips with animations from AE and others on to a green screen. Use PD to record the screen on HQ, then use the masking thing to green screen the recorded title onto your vid. The actual words may not be as well animated but combining the 2 should make for a good compromise! While you could imitate the effect, I don't think there's any way to make them look as slick and professional as they are on that Vid link or on other video editing software. People constantly mention key frame but I have yet to see any PD created titles that look as good as those examples - happy to be proven wrong though! I think I understand what you're trying to do &, because it's difficult to create a clean animated line in Paint Designer, the masking step is necessary. In the PDtoots tutorial you linked, the step you may be missing is creating the image that masks the animated line. That involves using the same image you're animating - but with part of it transparent. If you have a look at this thread, you'll find some examples, a step-by-step "how to" document, & some packed projects showing the elements needed. For your logo animation, exactly the same steps are needed. It just depends which part you want to animate. Is that the best quality drawing you have of the logo? There are some unclean lines that make it a little difficult. Starting with a clean drawing & following the right steps, you can make something like this. Ah Tony thanks for that. I think I see what that method is now, I've been getting the layering different in my head. You're effectively letting the red line shine through the transparent lines and the rest is the standard pic? I want to animate the circle around the logo to go round clockwise. I've achieved it via traditional mask boxes that move with key frames, but can't believe there isn't a simple unmask solution with the pencil drawing tool? I have a higher quality pic but will play around with it first and come back to you. Not sure I'll be able to make it work though as they're intentionally not clean lines on the circular part! Quote Take a look at this user created express project. Here is a YT video on it: https://www.youtube.com/watch?v=Q1j76ZYOZAI . thanks tomasc but all i can see is just a short YT vid displaying the animation etc, no template to download or instructions? Quote Thanks for the feedback. I'll look at the vid and see if I can figure out how it works better. Also Jim sorry your links don't work, can you change? I'm fairly sure I looked at yours using mask boxes etc right? Sorry was preemptive in my reply! Quote Here are several tutorials that deal with unmasking a line on a map. They may contain at least part of a solution to your issue. Yup have seen those Jim thank you, they do work but it's a lot of work for what should have a quick solution in PD16 surely? Is it possible to use Paint Designer as a way to effectively unmask an image on top of another? I'm thinking primarily I want to use it to unveil an animation line on a map - but every time I do it, it just DRAWS the line I'm marking out instead of creating a particular mask layer. Is there a way to draw a mask layer? For example a simple travel line between 2 cities, or for another example, I want to effectively animate a circle around a logo as per attached. I would like to put a 2nd image beneath the attachment and have the circle be drawn in? I found this YT video which should be what I need, but when I follow the exact same instructions, again, it just draws the same line instead of unmasks the image? Quote The Titler Pro add-on is dated, but it will help you create much better titles without an additonal cost. You will find some tutorial lessons here. Jim, thanks for the link but the tutorials are fairly basic. Unless I'm mistaken there's not much out there for a guide on how to create more animated titles that unmask etc as per the sample video? I've noticed that too, though it's never looked so bad I had to ditch it. It seems to be more noticeable with particular letters... & even particular fonts. You used the default "Segoe" font, yes? I wondered whether the same thing woud occur if I used titles instead... and it did. This was using "Segoe Semibold" font. When I switched the font to Calibri, it wasn't nearly as noticeable. It's just a case of finding the sweet-spot font. Thank you! Such a strange annoyance to PD that makes things just that little bit more difficult...making me rethink buying it! As an aside, I think I figured out a way to fix it! I removed the border from the words and it seemed to fix it. 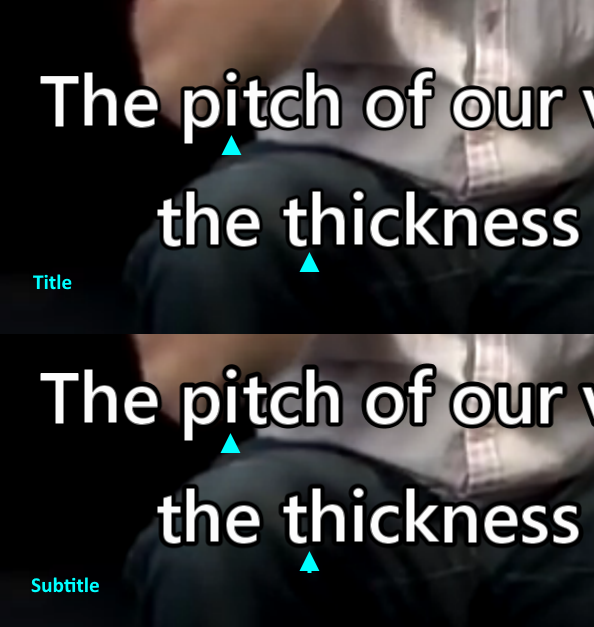 But actually, when I rendered the original file in Segoe and with black border at a higher quality, the subtitles were far more consistent and high quality. The Blender titles look great, how can we use them in PD? Quote The first few seconds of the dropbox video has about 120 pixels chopped off at the bottom when viewed full screen on my monitor, that is normal with any viewer/player for the pc. The subtitles are not tilted but level on my pc in that first 11 seconds. Perhaps you would like for the subtitles to be moved up a little. Please wait for other users to view your dropbox video and give an opinion on what they see that might be wrong with the subtitles. Need other readers here to respond and let us know if the subtitles are level or have other problems with your video viewer or player on their monitor. To make clear what I mean i also attach an image screenshot of the subtitles. Hopefully as you can see, they're not equally spaced, are not uniformly level, and almost look like they've been individually stuck in one by one by hand rather than aligned neatly. Quote Can you please describe in detail what did you really mean by wonky that is not acceptable and what do you really want. Hi tomasc - if you look at the video you'll see what i mean within a few seconds. The letters do not come out level and are wonky - completely unusual and no idea why this is happening. I've been producing a vid and been adding subtitles, and haven't had this issue previously but now seem to be seeing that the subtitles that are added in are in effect, coming out wonky. You'll see what I mean in the short speaking parts. Anyone have any idea how/what is happening?